Remember how I said I bought eight heads of broccoli? We’ve finished off the lot and if anything it’s spurned on an even greater broccoli obsession. Seriously, the stuff tastes good on everything! 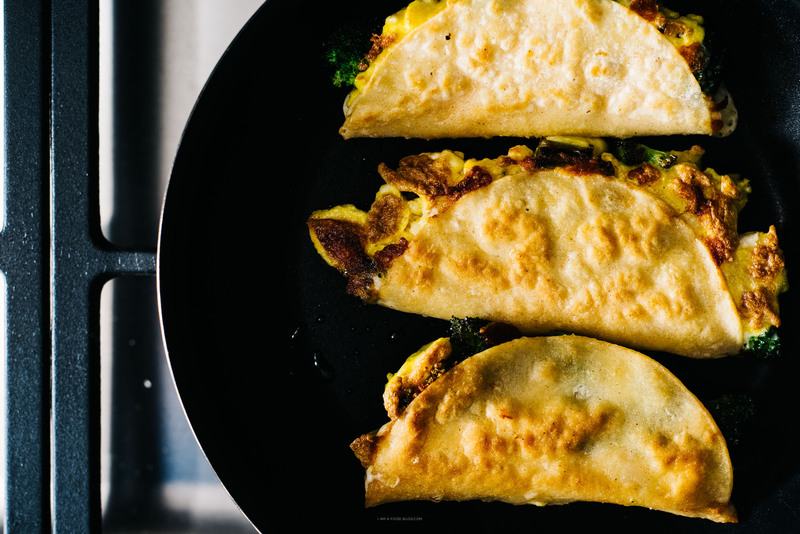 Case in point: these scrambled egg, broccoli and cheese filled breakfast quesadillas. Quesadillas were never really on my radar when I was a kid; I was a grilled cheese kind of girl. In fact, I’m not too sure when I even had my first quesadilla, but now I’m totally addicted. 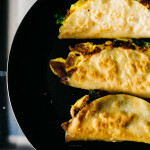 Quesadillas are the best of both worlds: melty cheese and crispy, crunchy tortillas. They’re kind of like eating a freshly fried cheese-filled tortilla chip. If you’ve never had quesadillas, go ahead and do a plain cheese because cheese quesadillas are delicious. 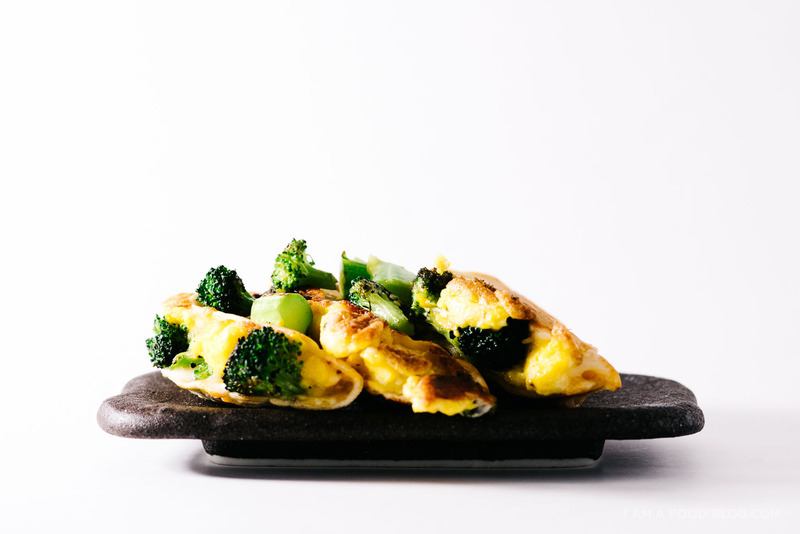 But if you’re feeling a bit adventurous, fill ’em up with scrambled eggs and broccoli. They’re delicious and festive enough for St. Patrick’s day. If there was a pot of these at the end of a rainbow I wouldn’t be mad, especially if there was sour cream involved. If your broccoli isn’t cooked yet, start off by doing that. I like to to cook them in a pan with just a touch of oil on high heat. They turn bright green and the edges just start to caramelize and turn brown. Season with salt and pepper and set aside. Scramble your eggs to your liking. Assemble by laying out your tortillas and evenly spreading out the cheese. Top half of each tortilla with equal amounts of scrambled egg and broccoli. Fold in half. Alternatively, you can make whole tortilla quesadillas. Just make them like sandwiches. Heat up a bit of oil in a non-stick frying pan over medium heat. Crisp up the quesadillas, turning once, until golden brown and cheese is melted. Enjoy immediately! Oh my gosh brunch queen, you strike again! I LOVE THESE! 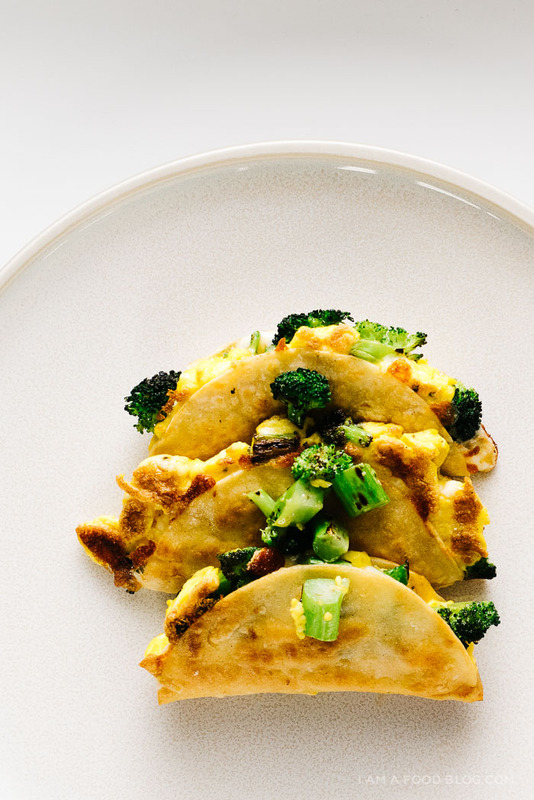 The broccoli sounds like it brings the perfect crunch to cheesy quesadillas — so genius. Loooove. Yes, yes, yes!! So delicious! No such thing as too much broccoli! Hm, I’ve never had a quesadilla. And I have a huge block of cheddar sitting in the fridge. 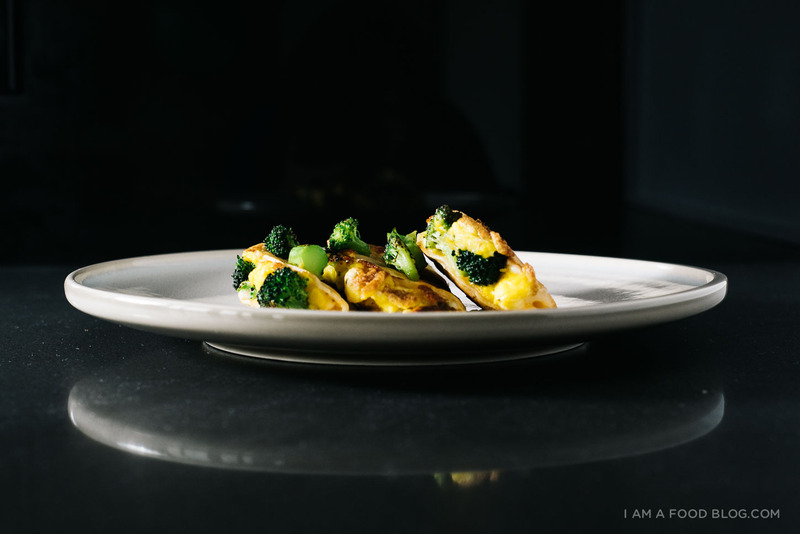 I am a broccoli addict, the stuff is so delicious and goes well in anything. I am tempted to do broccoli ice cream.. haha just kidding. Sour cream gelato though… I totally could. I’m obsessed with broccoli too. My favorite way to cook it is with olive oil, salt and pepper in a 415F oven until charred. Yum! Those quesadillas look delicious! And quesadillas for breakfast… uh, genius. I can’t even tell you how much I love this recipe! Simple straightforward and delicious- I love it! 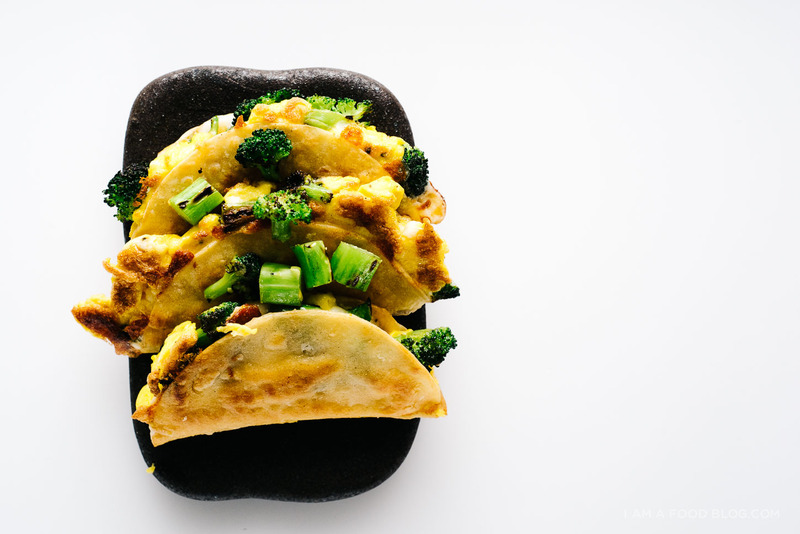 Las night, inspired by this recipe, I threw together a broccoli & kimchi quesadilla and HOLY MOLY was it perfect! I think I may be putting broccoli in all my quesadillas/tacos from here on out! This is the first recipe i tried from this food blog. It was really good for Sunday breakfast. Enjoyed much, thank you for sharing this nice recipe. OK, this recipe is BRILLIANT. 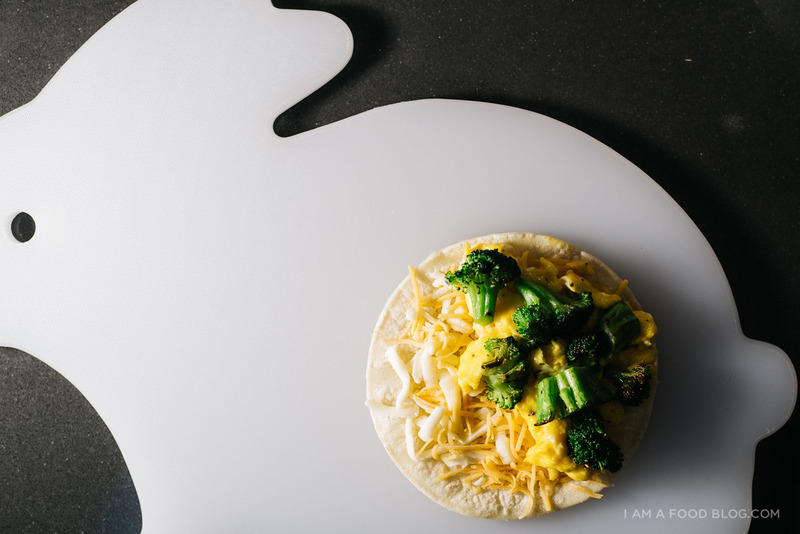 I love breakfast tacos and quesadillas… though I’ve never thought to add broccoli to them. And now? Well, it’s happening. And it’s happening soon. Because who doesn’t love a brunch recipe that’s decadent, yet still involves a vegetable? Would these hold up if freezing?